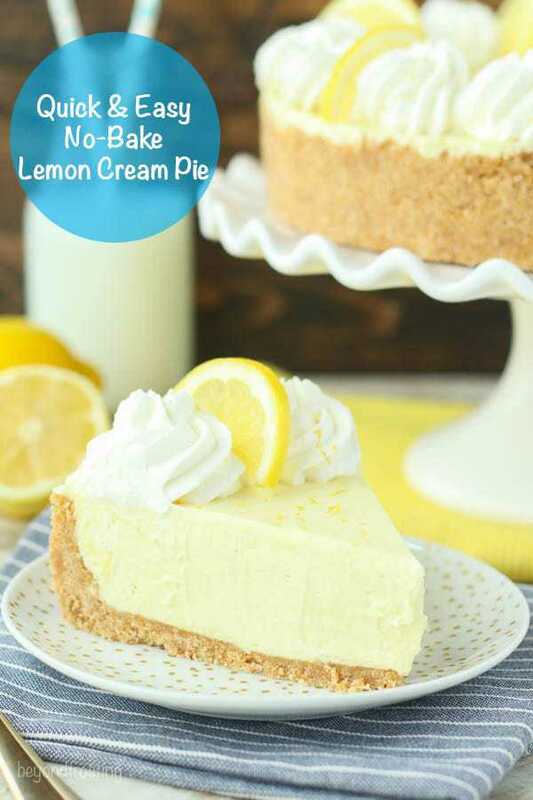 Quick and Easy No-Bake Lemon Cream Pie. There’s only 5 ingredients needed for the filling. 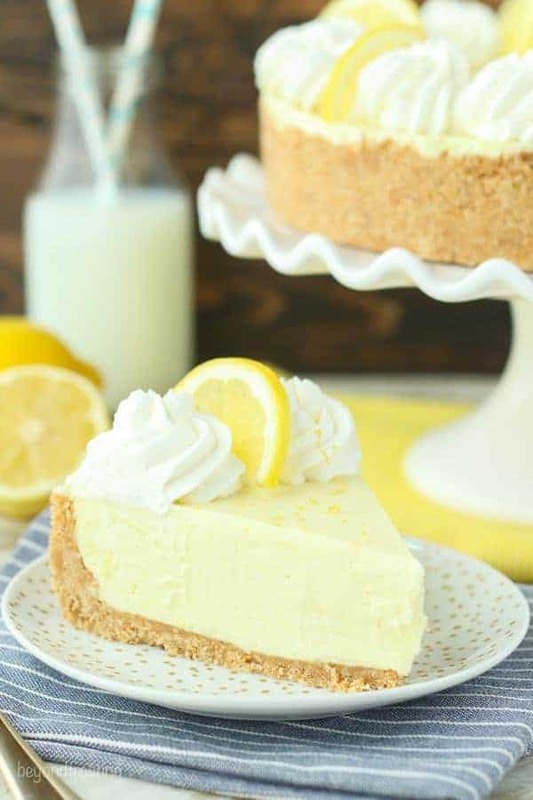 It’s light and refreshing, the perfect fluffy lemon pie! I totally went on a lemon dessert binge this spring. 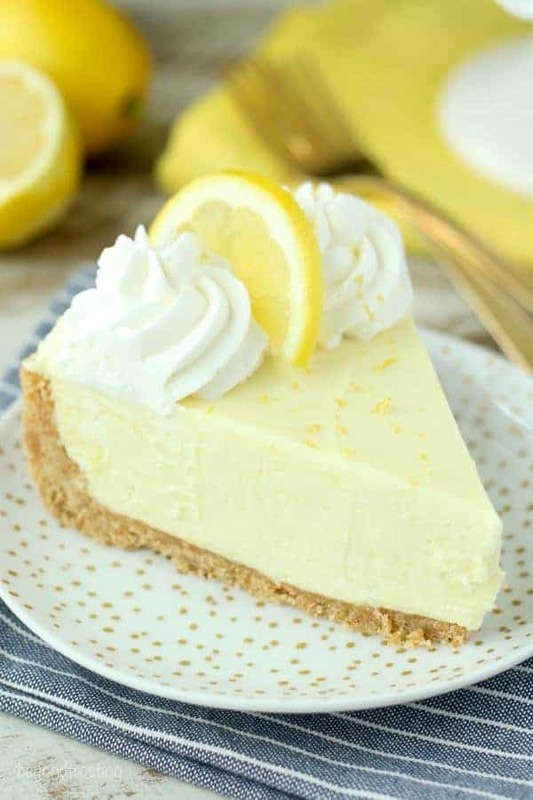 As lemon isn’t my go-to choice for dessert, I even surprised myself when I made 3 or 4 in a row last month. 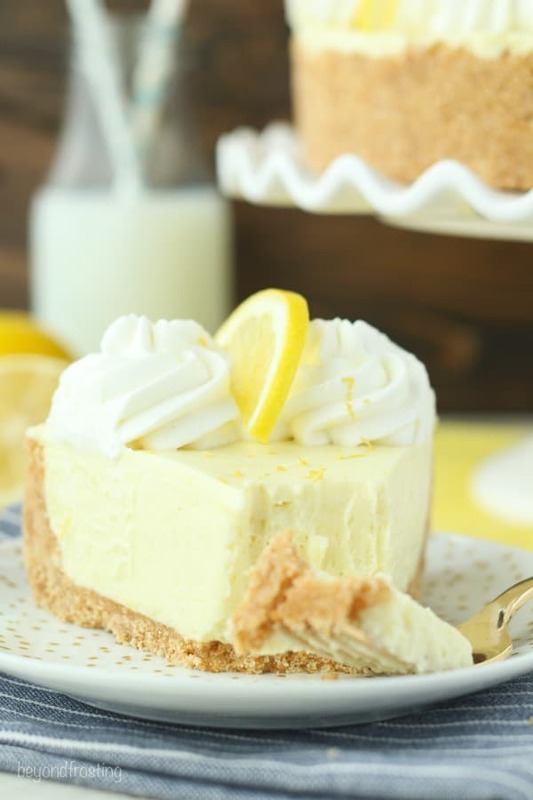 Truth be told, the Lemon Cream Pie has been on my mind for quite some time. I’ve ooed and awed over them on Pinterest for months. I first started with a lemon cream pie cupcake, but I knew there was a pie in my future. 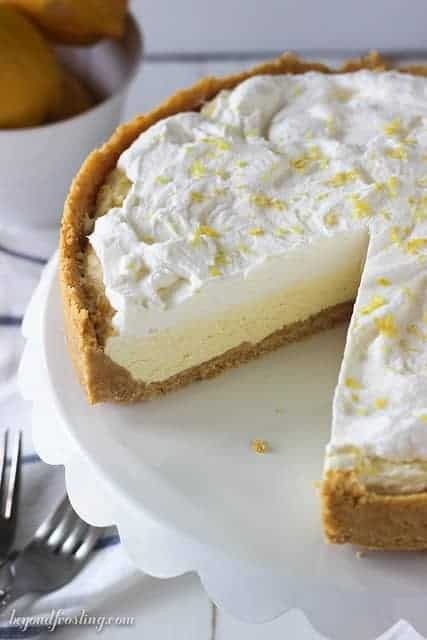 This pie is seriously so easy! 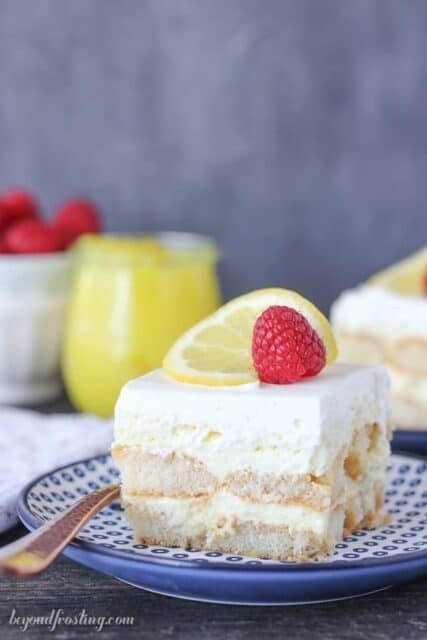 The filling is made with a can of lemon pie filling, sweetened condensed milk and homemade whipped cream. I chose the lemon pie filling because I knew it would give me a solid base from which to start. I reached for a can of Lucky Leaf, as my cabinet is stocked full! I always prefer to make my pies in a springform pan because I know I can make a deep-dish pie. I also love to peel away the edges of the pan and see that perfectly formed crust! I’ll admit I struggled with crust before, but my friend Lindsay gave me a tip: grease my edges with a little bit of cookie spray and that seemed to do the trick. In the past couple of years, I’ve taken it a step further and purchased cake collars, which are just sheets of clear acetate. I line my pan with these and it allows me to get those perfectly smooth edges. I also like to take the bottom of my angled spatula and gently press down the edges of the crust so they are somewhat even and compact. I also find that it helps to refrigerate the crust before adding the filling so that the butter has time to bind the crust together. Some people prefer to bake their crusts for 10 minutes, but I am usually too impatient to wait for my oven to heat up. The crust for this Lemon Cream Pie is made with Nilla wafers. They are a little bit sweeter than graham crackers and a little lighter in color. I like how the crust doesn’t overpower the filling here. Even though a graham cracker crust is probably just as good, I really think the Nilla Wafers are a better choice here. Don’t forget I have a tutorial for how to make a no-bake crust. This is a fairly stable pie, meaning that you can dig your fork right in and the structure of the pie holds it shape. This is a requirement for my no-bake desserts! The filling itself definitely meets my qualification for “mousse” as the texture is somewhat light. At first I was concerned that the filling might be too tart and overpowering, but that’s where the sweetened condensed milk comes into play. It’s used as a thickening agent but also to balance out the tart lemon pie filling. I also added a hint of lemon zest to the filling to get that final pop of flavor. I don’t want to to tell you your business, but you can definitely have a second serving of this pie. Grind one full package of Nilla wafers into a fine crumb using a food processor or blender. In a small bowl, melt the butter in the microwave for 30 to 45 seconds. Pour the melted butter over the crumbs and stir until the crumbs as well coated. For the filling: Place the metal bowl and mixer in the freezer for 10 minutes to Chill. Pour the heavy whipping cream into the chilled bowl and use an electric mixer to beat the heavy cream on medium-high speed until the cream starts to thicken. Slowly add the powdered sugar and continue beating on high speed until stiff peaks form. Set aside. 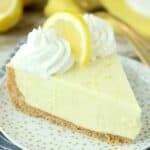 In a large mixing bowl, combine the lemon pie filling and the sweetened condensed milk and stir until they are well combine. Next add the prepared whipped cream and lemon zest and continue to fold together until all of the ingredients are well combined. Pour the filling into the prepared pie crust and refrigerate for a minimum of 4 hours until the filling is set. For the topping: Prepare a second batch of whipped cream by chilling your mixing bowl. Pour the heavy whipping cream into the chilled bowl and use an electric mixer to beat the heavy cream on medium-high speed until the cream starts to thicken. Slowly add the powdered sugar and continue beating on high speed until stiff peaks form. Pipe the boarders of the cupcakes using a large open star tip. Garnish with lemon slices. This pie must stay refrigerated. Feel free to substitute an 8oz container of Cool Whip instead of making the homemade whipped cream for the filling. This was so yummy! I did sub lemon curd for the filling and worked great. I’d like to make another one and freeze it. Will it freeze well? How sweet is this recipe with the condensed milk and powdered sugar? Could you use Stevia instead? Hi Kathy, I’ve never baked with Stevia, so I am not sure. Could you use instant lemon pudding instead of the pie filling? Do you mean if your prepared the pudding first and then mixed it in? I have not tried it, you may need to reduce the Sweetened condensed milk. If you just did instant pudding and whipped cream it would definitely work. WOW! Was I happy to find this recipe! The fresh ingredients and ample amount of zest and lemon juice is what caught my eye. I was intimidated at first with using the double boiler but I followed your directions and it came out perfectly. My husband and I couldn’t quit “sampling” it. We are having our family get together today and it will be front and center. Thanks for a great recipe. 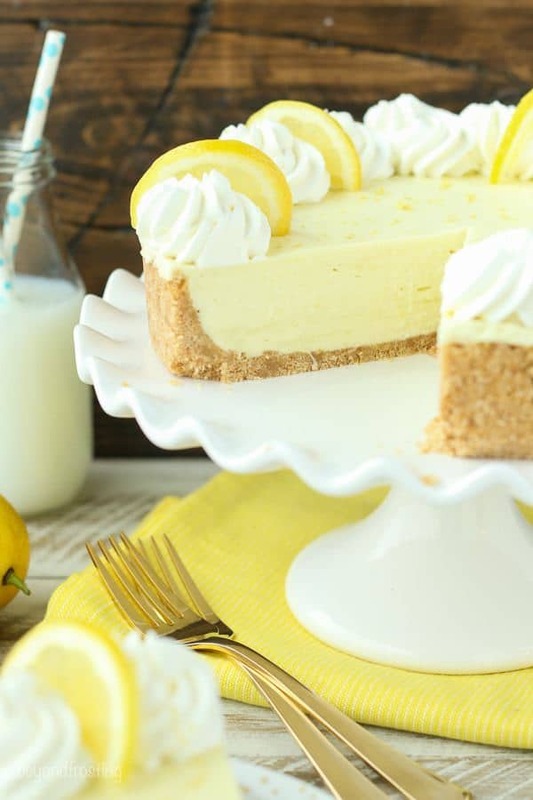 Have you tried making it with lime and using a graham cracker crust. We are big fans of Key Lime pie but don’t have a decent recipe. Hi Tracy, I am SO glad you enjoyed this recipe!! I have no tried it yet with lime actually but I love the idea! This looks delicious! Could you substitute lemon curd for the pie filling and if so, how much? Hi Michelle, I think you could but I have not tried. I would suggest starting with 11 ounces, which is about half of the amount of pie filling, and maybe reduce the sweetened condensed milk to 3/4 of a can. See how thick the filling is before you add the whipped cream. Yum. Looks so refreshing too!